Crisp and flavorful, these Garlic Chicken Thighs are an easy main dish with just a few, simple ingredients. A couple quick minutes of hands on time in the skillet, then these chicken thighs slowly finish braising in the oven. Bring on the comfort food! Add a fluffy biscuit and green veggies and call it dinner! 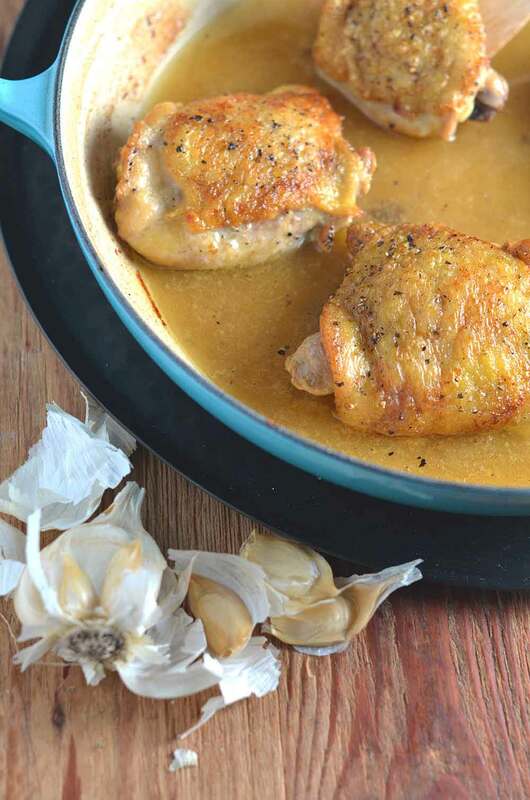 This delicious Garlic Chicken Thighs recipe is from my friend Jessica over at the JessicaNWood blog. As many of you know I grew up in the north, but lived in the south for many years before we moved back to New England. So when Jessica says “y’all”, I’m right at home. It’s been a pleasure collaborating with her in the past few months, getting to know her story. ‘Cuz I am always up for a story. Have so enjoyed following her beautiful blog. I know you’ll love the recipe she’s sharing today. “Hi y’all! I’m Jessica! On my food blog I share my favorite recipes and kitchen tips to help us simplify supper, enjoy dessert, and spend more time around the table with the people we love. My husband and I live in North Carolina and we recently adopted our son from the Philippines. I’m so glad Allie invited me over to share a recipe with y’all today. I absolutely adore Allie and her blog! Recently Allie shared a delicious Chicken Scampi recipe on my blog. I highly recommend adding it to your weeknight dinner rotation – it’s simple and delicious, filled with herbs and garlic and chicken and pasta. We had it the other night and I absolutely loved it! I wanted to share another spin on that beautiful combination of garlic and chicken with you today. My Garlic Chicken Thighs are super simple to make, use ingredients you probably have on hand, and are finished off in the oven so you are freed up to tackle something else. I’ve been on a mission in my weeknight dinner recipe writing lately to use as few ingredients as possible while still delivering delicious flavor. These garlic chicken thighs definitely fit that bill! Both chicken stock and garlic bring a lot of extra flavor to the table and they are ingredients I almost always have on hand. To make Garlic Chicken Thighs, we start by browning the chicken thighs skin side down in a hot skillet. Once the skin has started to brown, remove the chicken thighs and set them aside. 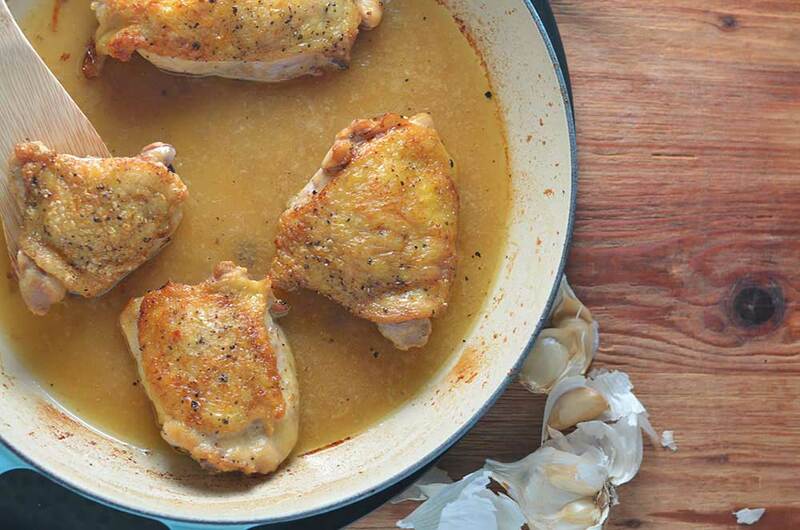 After deglazing the pan with chicken stock, we grate four cloves of garlic directly into the skillet to create a flavorful, delicious sauce for the chicken thighs to simmer in as they finish cooking. There’s a lot of garlic in this recipe and you can definitely tone that down if you’d like, but the garlic does mellow out as it cooks in the oven so you don’t get a sharp garlic bite. The chicken thighs slowly finish cooking in the oven, soaking up all of that garlic sauce in the process, leaving us with tender, flavorful chicken thighs and crispy, delicious skin. We love this easy dinner at our house and I hope y’all do too. Many thanks, Jessica, for guest posting here today. Can’t wait to try your easy chicken dinner I know my whole family will love. Also excited to follow your son’s adoption process! My thoughts and prayers are with you on the journey. Heat olive oil in large oven-safe pan over medium-high heat. Sear chicken skin side down for 2 minutes or until skin is browned. 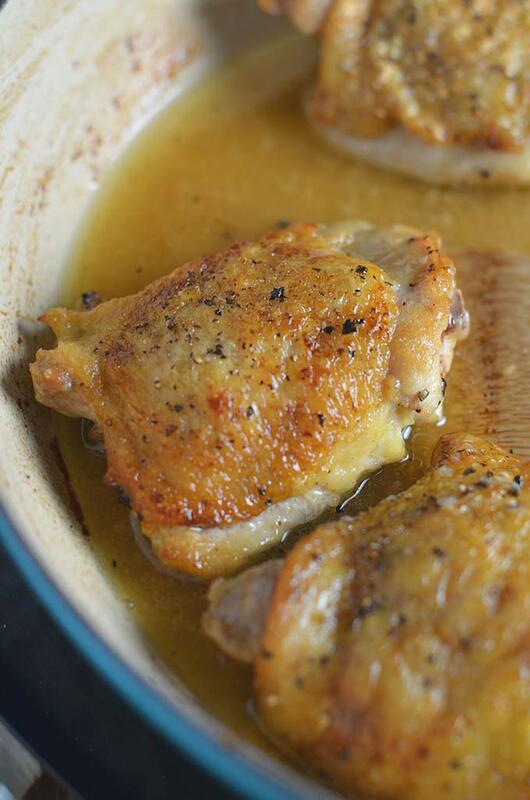 Remove chicken from pan and pour off grease in pan (don't clean pan). Pour in chicken stock and scrape bottom of pan to deglaze. Add grated garlic and any remaining pieces of garlic clove that aren't grated. Let garlic and chicken stock simmer for 1 minute. Remove large garlic pieces from pan. Return chicken thighs to pan with skin side up and put pan in pre-heated oven. Bake 30 minutes or until chicken thighs are cooked through(this will depend largely on the size of the chicken thighs). Serve with pan sauce and enjoy! I love how seemingly simple this recipe is, but I'm drooling looking at the pictures as I know it's packed full of flavor. Looks fabulous! Hi Allie - lovely guest post today. I love these kinds of recipes - simple and delicious. We'll use this one for sure. I have to add that my friend and her husband just adopted a 3 year old boy. It was a long road, but these last few months have been such a joyful experience. Best of luck with the whole process, Jessica. Take care y'all. Love a dish with plenty of garlic! nice idea to put some cloves by the photo too. Hi Allie I love this recipe and I am sure going to try it! Best wishes for your friend Jessica and her husband. Hugs! So nice to meet Jessica here - thanks Allie for the intro! 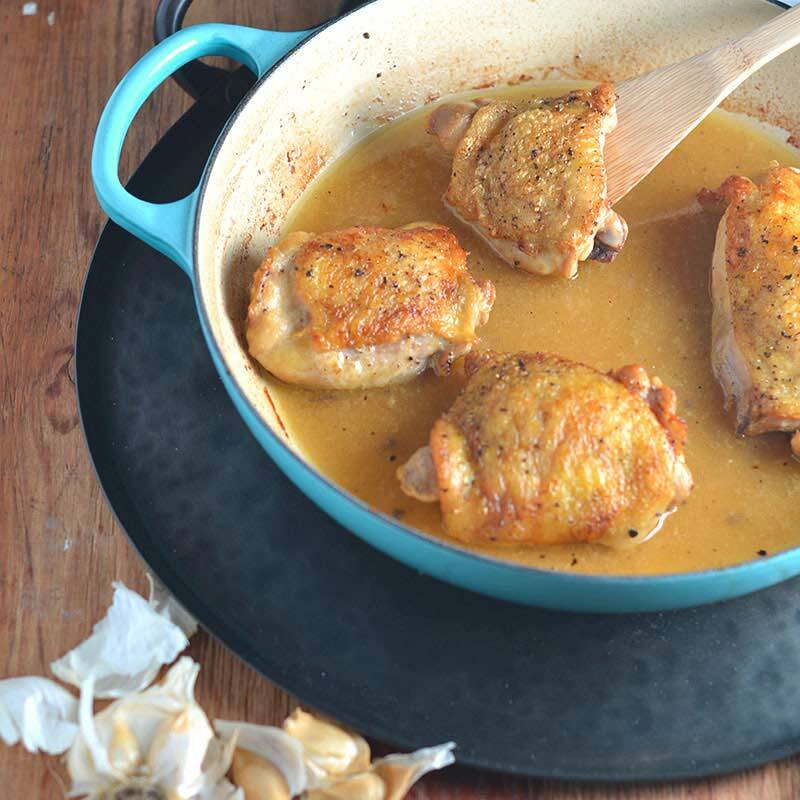 BTW these chicken thighs look mouthwateringly good - I love garlic and this simple recipe sounds like it would be a winner at my home! Oh, my, Jessica- these look scrumptious and so easy-can't wait to try them! And blessings on your adoption journey-may God bless you through it every step of the way! My kind of recipe. Love every ingredient and it is simple. I suspect this will end up being a regular dinner. Thanx! We go through a lot of garlic in this house! I know my family will love this...can't wait to try it! 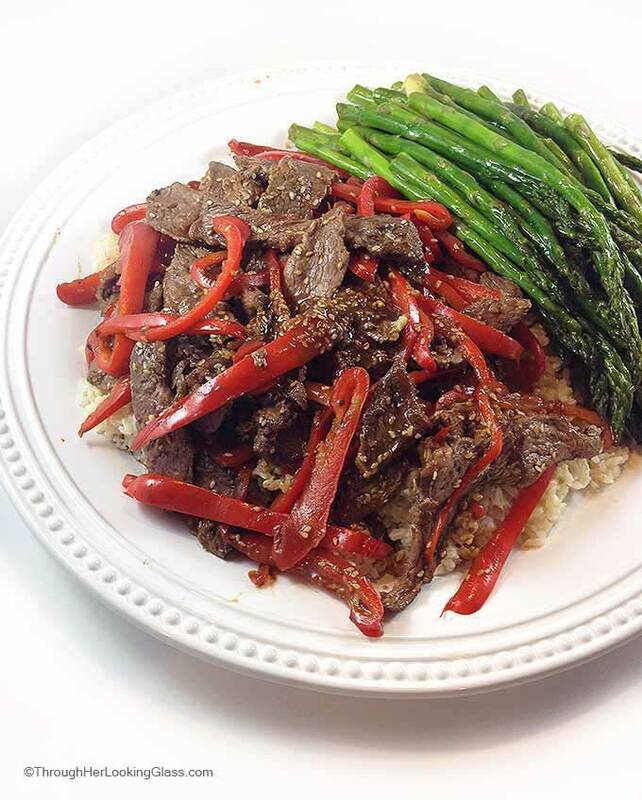 Thanks so much for sharing, Jessica- This looks absolutely delicious! I love this simple list of ingredients! The sauce sounds absolutely perfect! I so prefer thighs over breasts when it comes to chicken. Also, the more garlic the better. Very nice! These look absolutely fantastic! Love the simplicity of this dish, perfect for an easy dinner! Luci’s Morsels | fashion. food. frivolity. Our kind of dinner, we love chicken and are total garlic junkies! :) And so easy to make: perfect!